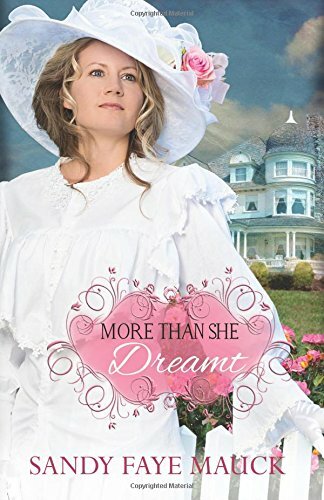 More Than She Dreamt by Sandy Faye Mauck is a delightful Christian historical novel set in 1905 and I absolutely loved it. There are many good books in the world but this one is something extra special. It has the ability to really get into and speak to your heart. It is beautifully written and full of godly truths that will penetrate your soul. It has a magical fairytale touch, but is so much more than that. It is just simply wonderful. My words can never do it justice, you need to experience More Than She Dreamt for yourself. Young widow Katie is mother to two young children, Sarah and Jeremy who are delightful. There are some truly touching moments with the children and there are definitely times when the reader is laughing out loud at the Jeremy isms! Sandy Faye Mauck really knows how children talk as she has captured the pair beautifully. Two themes in the novel are those of prayer and redemption. As young Sarah says “God really hears your prayers.” In the good times, pray. In the bad times, pray. God is never too busy that He won’t hear your prayers. Pray for your friends and pray for your enemies. No one is too far from God’s love. He longs for His people to repent and turn to Him. He is in the business of redemption. There is the theme of the sins of the fathers visiting subsequent generations. “He has become the thing he hated.” It is time to break the chains of the past. It is time to forgive. It is time to release the captives. Trusting God is a major theme. Sometimes that is all one can do. We cannot see a way out of the darkness, but God can make a way when there seems no way. God longs for us to put our hand in His and trust Him to guide us through life. God longs for us to take care of the widows and orphans. The whole story really pivots on this. Set at a time when there were no widows pensions, it was even more important to obey God’s command. Within the novel Sandy Faye Mauck shows that one’s mission field does not have to be overseas. There are people right where you are who need to hear about God. Our mission is to lead people to God right where we are. Some people will accept Him into their lives. Others will walk away and we must pray for them to receive Him one day. The characters were all wonderfully drawn. I loved the children, especially Jeremy with his turn of speech. Katie was a delightful leading lady. And Grandma Gwen was just the sort of Grandma we would all love to have. She practiced the gift of hospitality and gave out love by the bucketful. I really cannot praise More Than She Dreamt highly enough. It was beautifully written and the words just sank into my soul. I cannot wait to read more by Sandy Faye Mauck. A wonderful, wonderful book. An absolute delight to read but don’t just take my word for it… try it yourself. You will be glad you did. Thank you for the absolutely lovely review, Julia! It is amazing all the interwoven truths you gleaned from your reading experience. It makes this author’s work so worth it. Great post! How do I enter the giveaway? Nvm I figured it out!